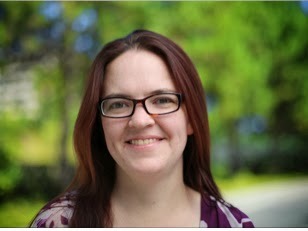 Liz Marley started her career as a software tester. She is currently a product manager at The Omni Group, crafting productivity software for Mac, iPhone and iPad. What do you like about your work? Do you think you have a different perspective as a woman, or do your male and female colleagues have similar approaches? I like that Omni is serious about design (and I think the Mac and iOS platforms encourage that as well). We know it’s not enough for software to work, it also needs to be understandable and pleasant to use. I enjoy testing software because the point is to figure out anything that can go wrong and fix it before it goes out to the public-- I feel perhaps a bit too much glee when I get to break things on purpose! Right now, all the developers and testers on my team are men, though there are other women in our company. I think sometimes my female colleagues are more likely to take an inclusive approach. For example, at a networking event, they’re more likely to ask the other person about their work than to talk about their own. When did you first become interested in programming? Did anyone try to convince you that it wasn’t “women’s work”? My high school programming class was perhaps 10 guys and me. I don’t remember if they actually said I didn’t belong, or if I just “knew” it. If I’d been less confident, I think I could easily have dropped that class and gone a completely different direction. I think my biggest encouragement was my dad. I don’t remember him ever explicitly encouraging me to major in computer science or do other “boy things." But he always let me get involved in whatever he was doing–trying out new software for the school, upgrading the school computer lab, building stage props in the woodshop–and told me about Harvey Mudd when I started looking at colleges. Harvey Mudd is a top engineering school which recently started a special program for recruiting and supporting women computer science majors. What can other colleges learn from this program? I think the biggest thing other educators should notice is that even though the intro CS course was primarily changed to help women get interested in computer science, it also helped men with no prior programming experience get more interested in the major. Increasing diversity doesn’t have to be a zero-sum game. What can K-12 teachers do to interest more girls in STEM (Science, Technology, Engineering and Mathematics) subjects? Tell them (and the boys!) about women who have done great things for STEM. Grace Hopper, Yvonne Brill, and other women have made major advancements in these fields, but don’t necessarily get fair credit in the news or history books. (For example: the New York Times was criticized for its obituary of Brill) But don’t highlight them as great women; point to them as great people. This past summer I helped out with App Camp for Girls, in Portland, OR. One of the rules we tried to follow when teaching these middle school girls how to program was that we weren’t allowed to touch the computer ourselves. I watched how this rule nudged the girls to actually do the work themselves and discover they really could do it. It also challenged me to improve my ability to explain things verbally, rather than showing or simply doing it for them. I think awareness is a big part of mindful teaching. Rather than just presenting the material exactly as it was planned in the lesson plans, observe and adapt. Observe the students: are they engaged, confused, or bored? Adjust the material to their level, or try a different explanation. Observe yourself as the teacher: do you have the energy to proceed with what was planned, or is it time to give them an exercise and take a 2 minute break for yourself? This observing could be mid-lesson or reflecting back over whole semester or longer. Do you have a mindfulness practice, and if so, how does it help you in your work? I think I have a deliberate one and an accidental one. I deliberately try to arrive at meetings a few minutes early, especially if I'm facilitating them. This usually gives me first pick of the chairs so I can choose a seat with more power if appropriate. It also gives me a few minutes to focus on my intentions for the meeting, both the formal agenda and any more personal or emotional goals. This helps me stay calmer during the meeting and have the focus to encourage the quieter team members to participate. My knitting has become a bit of an accidental mindfulness practice. Sitting down for a while in the evening and giving my hands something to do leaves my brain free to reflect on the day, what was accomplished, what should maybe be handled differently next time, and what needs to be done the next day. As a side benefit, I eventually end up with warm clothing that keeps me comfortable when the office air conditioning gets a little too zealous.